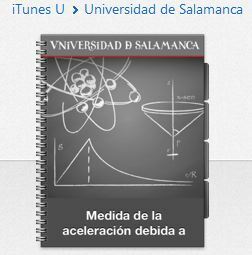 Nuestra preocupación por llegar a los alumnos no ha llevado a publicar cursos en iTunes-U, concretamente este sobre las prácticas que realizamos para la “Medida de g” con los alumnos de 1º del Grado en Física. 2. Si usted utiliza un sistema Mac OS, el programa Itunes ya se encuentra instalado por defecto. 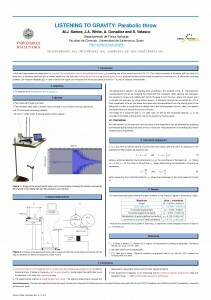 En este enlace puedes encontrar una serie de poster en los que se expone, de manera sencilla, experiencias para la determinación de la aceleración debida a la gravedad, utilizando la tarjeta de sonido del ordenador. Here you can find a file with the presentation of the masterclass. Single sheet for making experimental data discussed in previous entries. 1. Many software programs for recording and editing sounds can be found on the World Wide Web. An excellent free program is provided by Audacity (http://audacity.sourceforge.net/). 2. J.A. White, M.J. Santos, A. González & S. Velasco, “Timing the oscillations of a mass-spring system“, The Physics Education, (in press). 3. S. Velasco, M.J. Santos, A. González &, J.A. 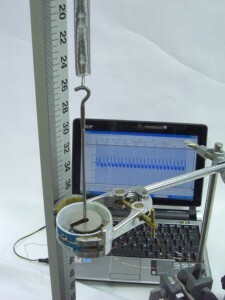 White, “Timing the oscillations of a pendulum“, The Physics Education, 46(3) 133-134 (March 2011). 4. S. Ganci, “Measurement of g by means of the ‘improper’ use of sound card software: a multipurpose experiment,” Phys. Educ. 43(3), 297 (2008). 5. J. A. White, F.L. 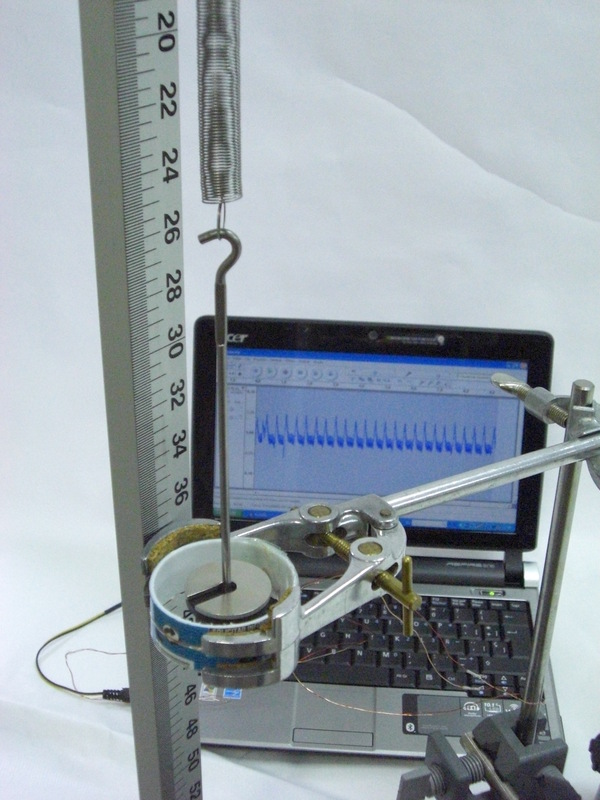 Román, A. Medina, and S. Velasco, “A measurement of g listening to falling balls,” Phys. Teach. 45(3), 175 (2007). 6. 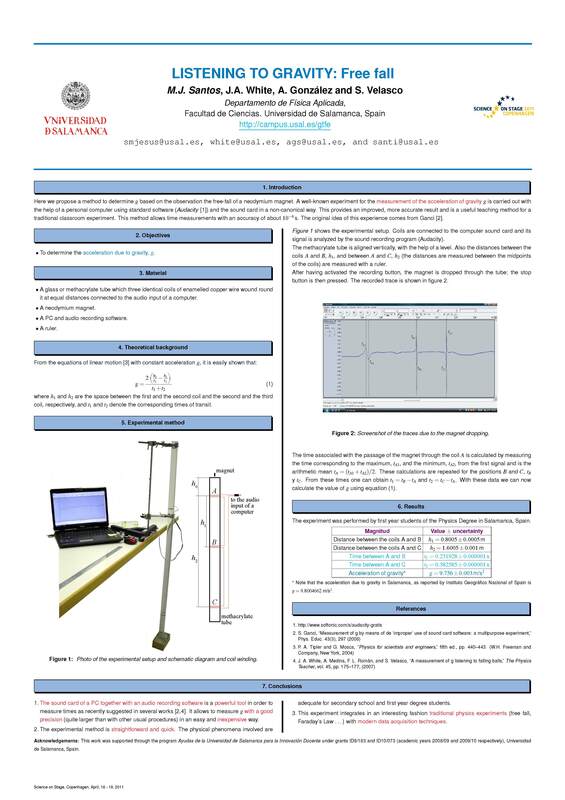 L. Hmurcik, A. Slacik, H. Miller, and S. Samoncik, “Linear regression analysis in a first physics lab,” Am. J. Phys. 57(2), 135 (1989). The simplicity and accessibility to reproduce these experiences. Very high accurate measurements of time (of the order of 10-4 s). It provides an alternative procedure to the software that is presented by the commercial laboratories for the same purpose. Faster measurements than using standard methods. 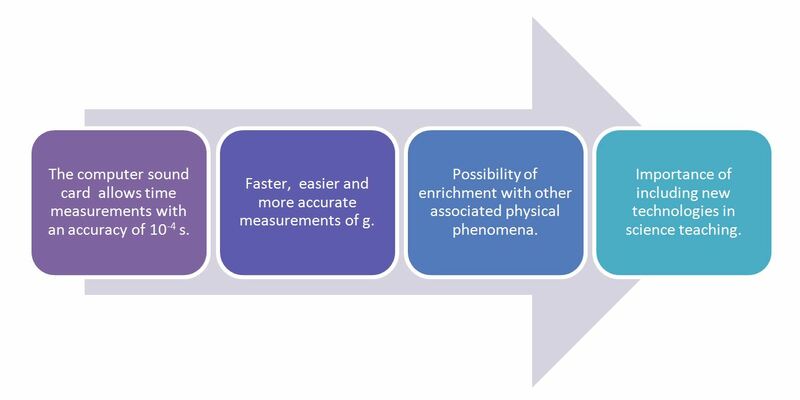 Possibility of enrichment with other associated physical phenomena to each experience. Importance of including new technologies in the education of sciences. The major advantages are the very low cost of the proposed experiments and they are easy to understand for students due to their familiarity with the software when it is used ‘properly’ for editing musical tracks.